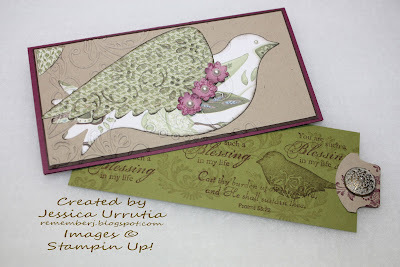 Stamp a Blessing: New Occasions Mini is here!! Good morning!! What is it with new catalogs that I get sooo excited? Not sure but I think is because I love the idea of stamping with friends, creating something pretty that I made ALL BY MYSELF, like my 5 yr old says and trying new goodies. Hehe!! ;-) Well, here is a sample of my favorite die that is now available through Stampin'Up! Occasions Mini catalog. The Elegant Bird Die. Isn't it beautiful!! I made these ones for a few gifts during Christmas. I created these checkbook covers a few month ago when my bank stop sending me one :-( I love them!! Hope you do too! 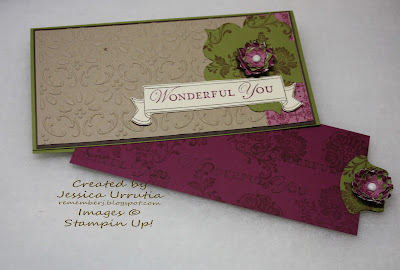 Leave me your love with your comments and visit my store at www.rememberj.stampinup.net Contact me!! Interested in being a demo? 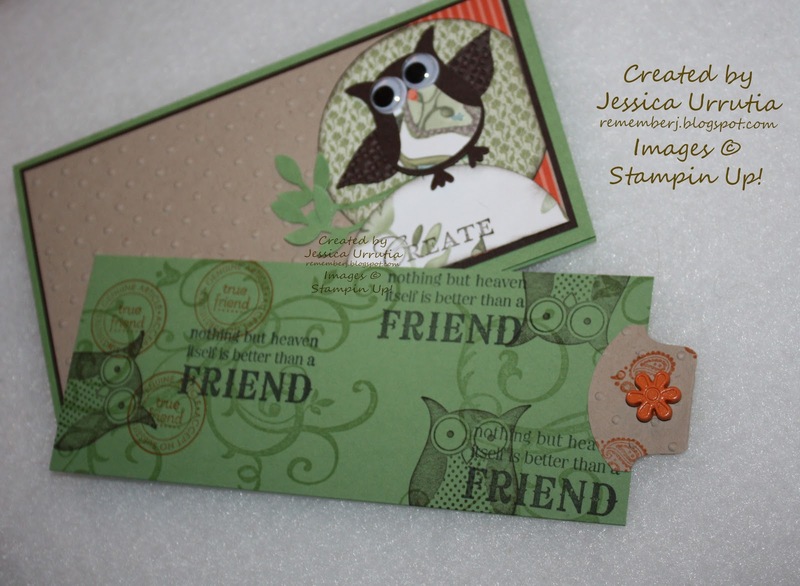 Honestly, is the best choice to start stamping and for the seasoned stamper too. Ask me!! Stamp Sets: Punch Bunch (retired), Blessings from Heaven, Baroque Motifs,Loving Thoughts (OCCASIONS MINI). Tools: Big Shot, Perfect Polka Dots EF, 2 1/2 Circle Punch, Round Tab Punch, Bird Punch, Owl Punch. Accesories: Flower brads, google eyes ;-) Paper: Wild Wasabi, Early Expresso. Crumb Cake CS, Paisley Petals DSP, Brights Collection. Stamp sets: Loving Thoughts, Take it to Heart, (both from OCASSIONS MINI), Fresh Vintage (sneak peek from SALEBRATION starts January 24th). Tools: Big Shot, Finial Press EF, Round Tab Punch, Boho Blossoms Punch, Fun Flowers Die. Accessories: Neutral brads. Paper: Rich Razleberry, Old olive and Crumb Cake CS, Brights Collection DSP.